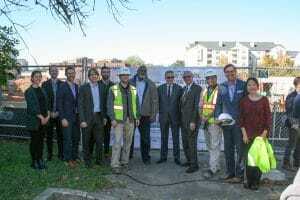 Arlington, VA – October 20, 2017 – On October 19, 2017 Gilbane Building Company and Arlington Public Schools (APS) came together to celebrate the construction progress at the site of a new secondary school with a bottom of foundation ceremony. The ceremony included remarks from Superintendent Dr. Pat Murphy and School Board Chair Dr. Barbara Kanninen, a project overview by John Chadwick, a performance from H-B Woodlawn Chamber Singers and a time capsule presentation. Students from the H-B Woodlawn Secondary Program and the Stratford Program presented objects representative of the year 2017 to be included in the time capsule. Some of the objects included a USB file, a newspaper clipping from the date of the ceremony, a Frisbee from the H-B Woodlawn state champion Ultimate Frisbee team and even a capsule of thyme. The time capsule was then presented to the Gilbane team to place on the site of the new school facility on Wilson Boulevard that will be the new home for the H-B Woodlawn and Stratford programs. Also in attendance Bjarke Ingels Group (BIG), Leo A. Daly, H-B Woodlawn and Stratford program students, and members of the local community. Gilbane is providing construction management at-risk services for the new school, which is projected to finish in time for the start of school in September 2019. The school will be approximately 180,000 square-feet and house 775 students in the H-B Woodlawn, Stratford, ESOL/HILT and Asperger’s programs. Scope of work has included the abatement and demolition of the old “Wilson Elementary School” that was located on the site, as well as construction of the new school facility with five stories above-ground and two below-ground. The project is designed by BIG and Leo A. Daly. Gilbane provides a full slate of construction and facilities-related services – from pre-construction planning and integrated consulting capabilities to comprehensive construction management, general contracting, design-build and facility management services – for clients across various markets. Founded in 1873 and still a privately held, family-owned company, Gilbane has 48 office locations around the world. For more information, visit www.gilbaneco.com.